Longtime Napa resident Ina Block passed peacefully on September 4, 2018. Ina moved to Napa in 1960 with her then husband, Dr. Alvin Block, where they raised their three sons and were active members of the Napa community. Ina was a bright and vivacious person who had countless friends and was involved in many local activities over the years. She was deeply devoted to her family and was a wonderful mother and grandmother. Ina had an extraordinary friendship and loving family relationship with her sister- in-law and brother-in-law, Frankie and Rodney Block. Ina was born in Sudbury, Massachusetts on February 13, 1935. She studied at Boston University and lived for two years in Miami, Florida before marrying and moving to Napa. She later earned her Bachelor of Fine Arts Degree at California College of the Arts, where she studied art history. 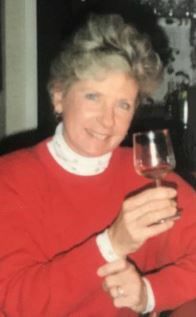 After raising her children, Ina became a local travel agent at AAA and was also a Napa tour guide for many years who always wowed visitors with her knowledge and love of the Napa Valley. She had many talents and hobbies – piano, photography, painting, reading, travel, sewing and embroidery, and arts and crafts. In her later years, she became an accomplished quilter and produced many beautiful quilts of people, animals, and landscapes. Ina loved classical music, walking, tennis, visiting with her friends, and watching Jeopardy every night. When asked shortly before her passing, she said “I’ve had a good life – I’m very happy with it.” Ina is survived by her three sons (Kevin, Greg, and Bill) and four grandchildren (Roman, Alex, Jake, and Nicholas). She will rest at Tulocay Cemetery.